County Leitrim is widely known as the anglers paradise. The many lakes and rivers support a huge population of wild fish. 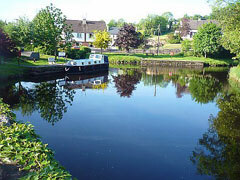 Leitrim is defined by water, which influences both the county’s character and local activities. There are lively riverside towns and cruise bases, with friendly pubs and impromptu music sessions. The Shannon-Erne waterway, Europe’s longest inland navigable waterway, stretches through the county. The county town, aptly named Carrick on Shannon for it's built on a stategic crossing point of the Shannon is a major angling centre with extensive coarse angling available on the main River Shannon and the many lakes in the system. Carrick itself is a buzzing town full of entertainment for the visitor, renowned for hosting group parties with its provision of a wide range of bar's, clubs, cafe's and restaurants all based around the waterside and modern marina. Situated amongst the hills of East Leitrim is Ballinamore, the lively home of Garadice Lake one of Irelands' premier waters. This hospitable town has hosted many All-Ireland Nationals over the years. Drumshambo is located on the Upper River Shannon at the Southern tip of Lough Allen. There are a number of lakes immediately around Drumshambo centre. productive coarse lakes and the Rinn River.